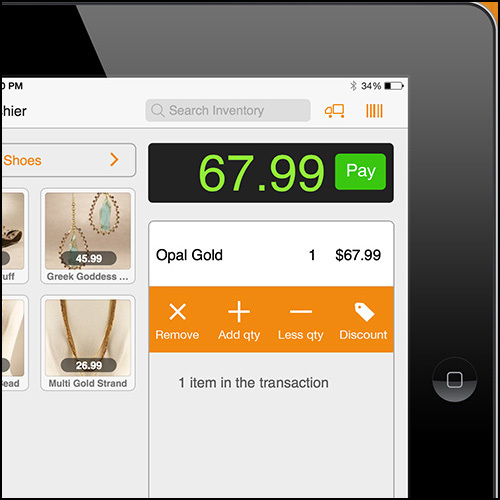 Cashier Live is an app that works on smartphones, tablets, and computers to bring full service point of sale features to small businesses everywhere. The motto of Cashier Live is very simple: accepting payments should be simple. By combining great design with extensive usability testing, Cashier Live has made it quick and easy for you to complete transactions from your iPhone, iPad, or computer with a very short learning curve. Whether you use Cashier Live as a push-button style cash register or take full advantage of their barcode scanner technology using the built-in camera on your phone or tablet, you can speed up your checkout time substantially by using Cashier Live as you point of sale solution. Ring Up Sales: You and your cashiers will be able to quickly ring up products using your camera as a barcode scanner or using the app as a push-button style register. Take Payments: Accept cash, credit, or checks with the greatest of ease. Credit card processing requires service from one of our partners. Item Options & Modifiers: Sell items that use different parts or ingredients like a pizza shop? Keep detailed records while using modifiers to get the order perfect. Manage Inventory: Once you add a product’s information and quantity on hand, your inventory number will be automatically tracked. Email Receipts: Make your business paperless by emailing receipts instead of printing. Your customers will love it, and you’ll reduce waste. Want a paper receipt? We integrate seamlessly with Star receipt printers. Track Customers: Track customers by creating profiles with their contact information to offer them order tracking or promotions. Run Reports: You can run any sales or inventory reports you need right from the handy online dashboard at the Cashier Live website. Access Anywhere: Since the Cashier Live app is completely based in the cloud, you can access your sales data and inventory numbers from anywhere with an internet connection. Overall Review Overall, I would give my review of the “Cashier Live” app a rating of 3 out of 5 stars. During my review of the Cashier Live app, I ran it through all the normal functions that a normal business would with their POS system. While the functionality of the cash register portion worked just fine, I was not impressed with the barcode scanner technology or the fact that there isn’t a built-in credit card processing solution. The saving grace for the Cashier Live app during my review of its performance was the fact that the online dashboard offered great sales analytics and inventory management functionality. If they could get the barcode reader working properly and integrate a credit card reader into the mix, I would rate this POS app much higher.